above: Here where the Archbishop of Milan held court, where with the bitter duel of Ramengo and Lupo amidst the jokes and songs of Tremacoldo, T. Grossi [the author?] gave a life of courtesy and tragic passions to Ottorino and Bice, a faithful portrait of an ungrateful age in which will dominate the figure of Marco Visconti. 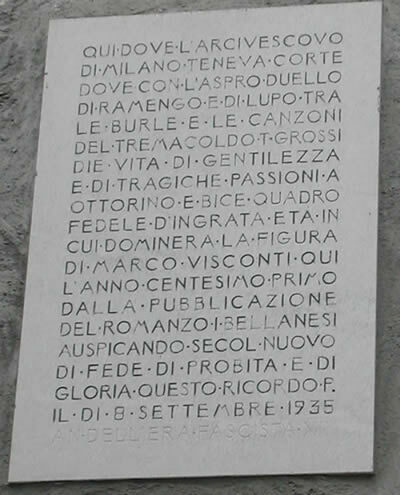 Here [in] the hundred and first year since the publication of the novel “The Bellanese”, with wishes for a new century of faith, probity, and glory, this memorial [set] on September 8th, 1935 – 13th year of the Fascist era.This plaque on a building in Bellano commemorates a novel we’ve never heard of – evidently the pious hopes of those who set the stone have not come true (but it appears that they themselves forgot to commemorate the book’s 100th year!). Note that there has been some attempt to whitewash that last line about the Fascist era. I can’t think of a good translation forsensibilizzazione. It means to make someone sensitive to or aware of something. 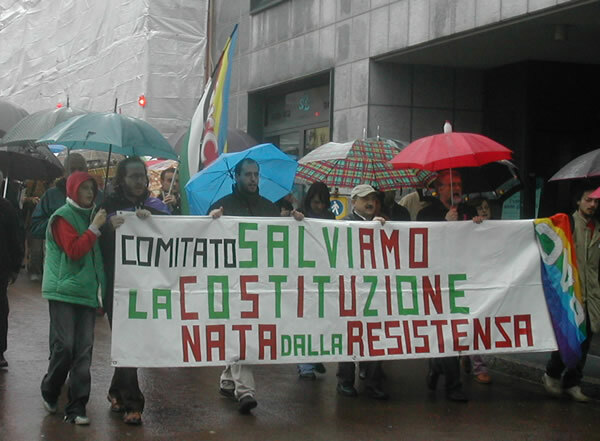 Comune can refer to the city, the city government, or the town hall building (though the building can also be called the municipio). Want my [parking] place? Take my handicap! Note the use of the English word. A handicapped person is called un portatore di handicap or (less PC)handicappato. The h is usually not pronounced. 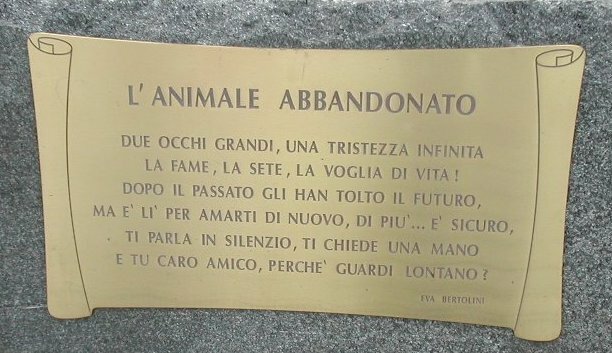 “In this place where Engineer Edoardo Stoppani accidentally died, His son Eugenio to the eternal memory of his defunct parent, Erected this refuge 1905” – note use of the passato remoto (remote past tense), rarely used in everyday speech anymore, at least in northern Italy. A rifugio is a mountain refuge to give shelter to hikers. Smoke hurts/is bad for you. 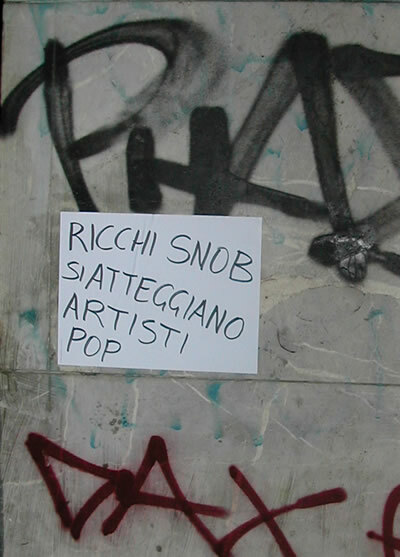 ^ “Rich snobs [who] pretend to be pop artists.” A comment added to wall graffiti, presumably by real pop artists. Hunger, thirst, the will to live! And you, dear friend, why do you look away? 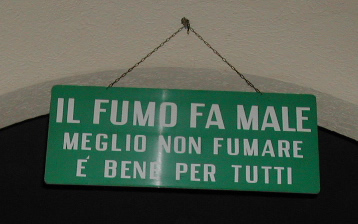 This sign sits in a piazza in Lecco. This entry was posted in Italian language and tagged Italian language on December 4, 2011 by Deirdre Straughan.